What is the secret formula of success? I wish I knew. What makes the difference between fame and fortune or not? My guess is it is actually purely luck. It isn’t talent. Lot’s of talented people never find fame or fortune. It isn’t personality – the same applies – there are lots of personalities around. Perhaps it is perserverance? I really do think you have to have the personality, the talent and perserverance but what really tips the scale is luck. Being the right person at the right time in the right place. Either that or there is a Devil and people really do sell their souls….. actually, the latter wouldn’t surprise me either in some cases. I think you probably can through visualization, energy, attention and so on. I haven’t yet discovered the formula myself though or else, well, I’d be famous by now and clearly, I am not. 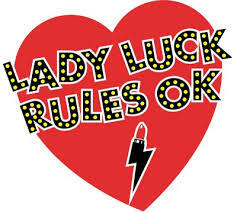 I need a bit of Lady Luck. I need to catch the moment and blow with the wind….. Meanwhile, I am working hard…….